For those of you who watched the Oscars last night, it was a night to remember – and not just because it was the Oscars. Most of the night progressed the way people had assumed it would; none of the major categories were surprises, Best Actor went to Casey Affleck, Best Actress went to Emma Stone, Best Supporting Actor went to Mahershala Ali, Best Supporting Actress went to Viola Davis, the screenplay wins went to Manchester by the Sea and Moonlight. In fact, the closest thing to a ‘surprise’ win could be attributed to Hacksaw Ridge winning Best Film Editing, but most viewers don’t know that Best Editing is 1) a major category and 2) often an indicator to what film will win Best Picture. But of course, this year, it was neither – and there were much bigger fish to fry. By the time Best Picture rolled around, most people assumed that La La Land was a done deal. Damien Chazelle had just won Best Director and Emma Stone had just won Best Actress, and lo and behold, Warren Beatty and Faye Dunaway called Best Picture as… La La Land. However, if you looked closely (or rewatched the tape), Warren was clearly confused by what was written on the card – and that was because it was the card FOR BEST ACTRESS IN A LEADING ROLE. Those who zoomed in on the card during Warren’s drawn-out gaffe could clearly make it out, but instead of looking on the other side of the card, Warren just showed the card to Faye. And even though Faye immediately called out ‘La La Land’, you can see Warren mouthing the words, ‘But it says Emma Stone’ to her right after. Now, should he have called over a stage hand immediately when he saw Emma’s name on the card? Yes. 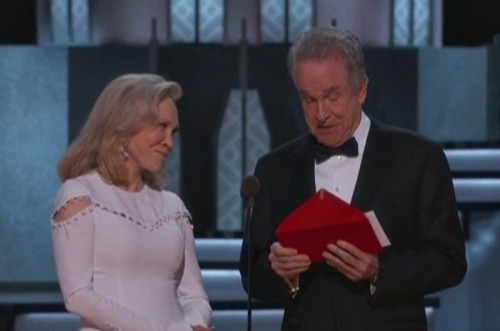 However, this is the Oscars – who would think that they would mess up on such a monumental moment? Warren was likely nervous, and Faye said the first title she could see. If we want to toss blame, let’s direct it to where it belongs – the accountants and stage managers who are responsible for making sure something like this NEVER happens. Anyway, the La La Land team comes up and is most of the way through their acceptance speeches when the whispers begin. Then, the PricewaterhouseCoopers accountants come up to the stage – and then, everyone realizes the La La Land card was the wrong card. 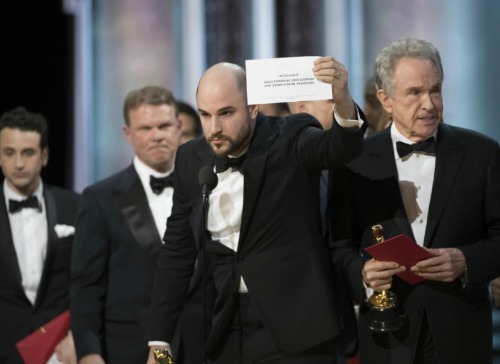 The right card is brought out… and voila, it’s Moonlight that won Best Picture, not La La Land. Of course, the Moonlight team, everyone in the audience, and everyone at home is freaking out by this point, but it was not a prank or a joke, Moonlight won – deservedly so – the Best Picture award.